Lili Apartment is an ideal holiday rental for a couple. You can reach Cala Bona beach and promenade in a minute and a short stroll will take you to the superb beach of Cala Millor. Shops, restaurants and the harbour are nearby yet you can enjoy the quiet location of the apartment for relaxation. 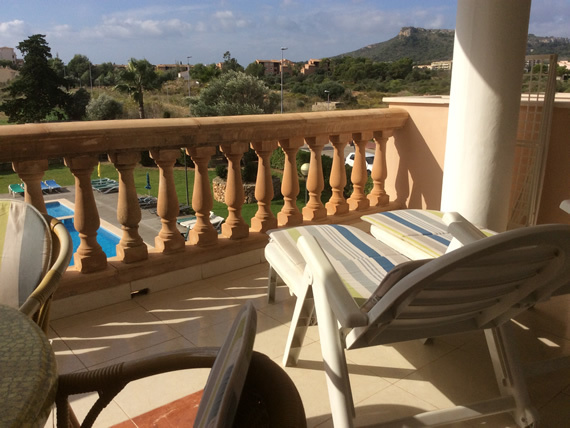 This lovely apartment with 1 double bedroom provides the ideal base for a holiday . Lili on the second floor is accessed easily by stairs or lift. Lili is fully equipped with air-conditioning and it benefits from an extra large sunny terrace. The apartment is set within a small private group in a quiet yet perfect central location. The landscaped gardens and private area provides a perfect place to relax daytime. Double bedroom with double bed (travel cot available). Air-conditioning and balcony with external aluminium shutter. Large fitted wardrobes. Main bathroom bath with shower, wc and sink. Fitted kitchen complete with oven, ceramic hob with extractor, large fridge/freezer, kettle, toaster, coffee maker and microwave. A separate utility area containing the boiler and drying space. The air-conditioned bright living room is spacious and has a comfortable sofa. There is an open-plan dining-area with table and chairs. The TV has satelite with available British channels. Double sliding patio doors provide access to the terrace. Large private terrace leading from the living-room over-looking swimming pool and pool terrace. From the terrace you can enjoy the beautiful sunset over Puig de sa Font. The private terrace, overlooking the pool with mountain views is the ideal place for dining or to relax at the end of the day with a glass of wine watching the sunset. Terrace table with chairs and sun-shade. There are two sunbeds with comfortable cushions also on the terrace. Security entry ensures the pool area is accessed by residents only. Apartment Lili is a super choice for a holiday rent in a prime location. The resorts of Cala Bona and Cala Millor offer a host of excellent amenities, beaches, restaurants, cafes, shops etc while retaining the unique charm of Mallorca. 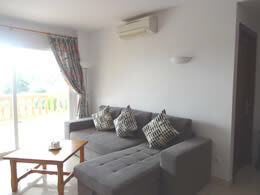 The apartment provides a comfortable base to also explore Mallorca by local transport or car.